One of the best things about the hostels of the engineering college at Banaras Hindu University (IT-BHU, Varanasi) was the cuisine on offer at the messes. Fresh, tasty, nutritious, and incredibly cheap! The IT-BHU messes are a subject of a post of their own, more about them later. One of the monthly highlights was the “paratha festival”; a weekend lunch where we would be served several varieties of parathas. Parathas are something I have adored all my life, and you will soon get to read reasons why. Suffice it now for me to say that these fests were just the right antidote to the week’s hard work. And well fortified I would have a grand snooze in the afternoons extending into evenings- till I was woken up by friends to catch the night show of a movie. I will return to the BHU paratha fests in a bit. I must tell you first about how my romance with parathas started. I have indelible memories of those triangular, layered parathas. They were the constant feature in my school “tiffin-box” for eleven years, right from kinder- garten till the tenth standard. We called them tikoniya parathas, the three-cornered ones. They were nearly always accompanied with aloo bhunjiya, potato sautéed with onions- sometime gobhi as well. The tiffin-boxe never varied in its shape and size. An anodized aluminum or stainless steel affair with a lid which would be affixed to the body by means of two “clasps” on either side which snap shut with the sharp clicks. The container would have a partition one-thirds the way. This one-third was meant for the bhunjiya and the rest of it was for the three parathas, each folded into half. Just to complete the story of the tiffin box I must tell you about the days I forgot to carry the box back home. The following day’s supply was rolled into a sheet of paper. Often a glossy sheet torn out of a magazine! Or an old calendar sheet. 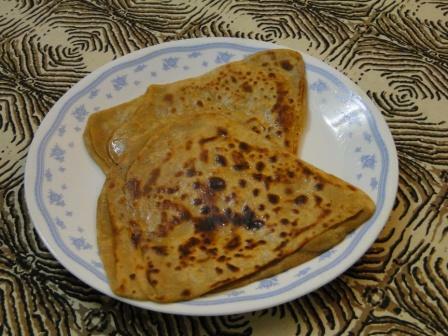 Parathas would nearly invariably be made with Dalda, or “khajoor chhap” as it was popularly known as. “Khajoor chhap” being a colloquism for the logo of the yellow-tinned brand from Lipton, two palm trees embracing each other. Sometimes the paratha would be elevated to another cooking fat- the blue-tinned Ghantoor ghee. The actual brand name for the ghee was “CK” (CK standing for Chanda jee, Khuba jee). The “Ghantoor” was the Bihari-speak for Guntur (coastal AP) where this ghee was manufactured. It is not that the paratha was had only with bhunjiya, there were several other agreeable accompaniments as well. For breakfast at home it could be had with milk, or its derivatives- dahi, kheer and sevai. It could also be had with pickles, sabzi or with plain sugar. For good effect- and ease of eating, sugar was placed along the length of the paratha (the perpendicular of the isosceles triangle, if you will) and the paratha was rolled into a well, cheeni-roll. Just the right thing to munch on as you flipped your textbook pages with your left hand and chomped at the paratha roll held with the other. Our house was strictly vegetarian, and I discovered later, that a paratha tasted divine with an omelette, a bhurji, chicken, mutton or an egg curry. Tikoniya paratha is only one in the royal family of parathas. There are the most gloriously appetizing stuffed ones. Aloo Paratha being the most popular one. Staple of a weekend breakfast in many a family. Aloo partha with dahi and pickles or with an egg bhurji. This was the standard daily breakfast on my travels during my sales stint in North India in the early 90’s. Nothing like a large, hot, crisp aloo paratha with some divine, thick dahi at a road-side dhaba in upcountry Punjab on a cold wintery morning before I caught a bus to my next work destination! Mooli partha- ones stuffed with shredded radish- was also a popular breakfast. The fillings could get really diverse depending on the creativity of the cook. You can use mashed chana daal, gobhi, and even keema. Even khowa paratha, paratha stuffed with the divinely sweet and mouth-watering khowa. And if you can’t stuff them, knead them into the dough. Like, for example, methi paratha! You thought the people from the Southern parts of India eat only rice and sambhar? Think again! Have you ever lasted the delicately layered Kerala Paratha? The Ceylon paratha is a close equivalent. Have you ever had the joy of having Kerala paratha with Malabari mutton pepper fry? Succulent and spicy lamb pieces with crispy parathas! If you- or your wife- cannot prepare these parathas, fret not. You can always order pre-cooked and packaged “ID Parathas” available at every “kaka-shop” in the neighbourhood. If you don’t know what a kaka-shop is, or if a kaka-shop does not exist in your neighborhood then you probably do not deserve to have these parathas. Amen! PS: We are on a family holiday to Mauritius. I am taking my kids around the breakfast spread and we are all admiring the vast array of dishes. Cheeses, fruits, meats, breads, my kids are totally impressed! Mostly continental stuff though as Mauritius is hugely popular with European tourists, specially the French and the British. Suddenly I hear my younger one exclaim: “Papa, look! Paratha!! But I don’t know why they call it a faratta. I scramble closer to where the action is, and I spy upon those juicy tikoniyas right next to a large bowl of aloo-sabzi. And then I realize, Mauritius has been largely peopled with men and women from Bihar, wretched indentured labourers who came from Bihar. You can take a Bihari out of Bihar, But not the paratha out of a Bihari! Partha or faratta, does it make a difference? I must admit I was not prepared for Angkor Vat. At all! All I knew it was an old Hindu temple in Cambodia. Only when I visited the place I realized there were three mistakes in my short presumption. To start with, the age of the temple. It is not old, but very, very old. I am sure that you will agree that something built in the 1000-1300 AD does indeed deserve to be called old. Only a few centuries younger to our very own Ajanta and Ellora. While Angkor Vat is indeed the name of one of the temples -one of the most glorious ones at that- the Angkor Vat complex houses hundreds of temples across a sprawling area of maybe a few hundred square kilometers. And the temples are not solely Hindu, they house Buddha statues as well. Some temples have alternated between Hindu and Buddhist over time depending upon the faith of the then king of the land. Somewhere in the middle of the first millennium, Hinduism moved eastwards from India; probably due to the travels of traders. Cambodia was a place where it struck roots and flourished for centuries. It was occasionally overtaken by Buddhism which had also spread from India to the far corners of Eastern Asia; from Burma and Thailand to Japan, China and Korea. 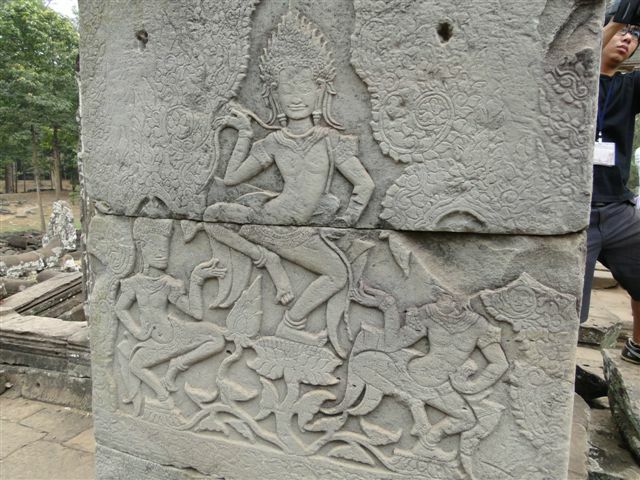 The Khmer kings of Cambodia were not all Hindus, some were devout Buddhists as well. Hinduism was the more dominant of the two till the 13th century when Buddhism, patronized by the then king became the state religion. All the kings had very Sanskritized names; Suryavarman, Jayavarman, Yashovarman. 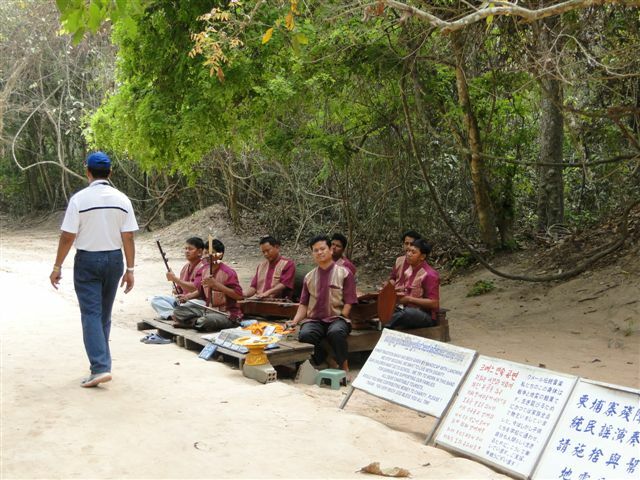 Point to remember here is that they were not Indians, but Khmer. 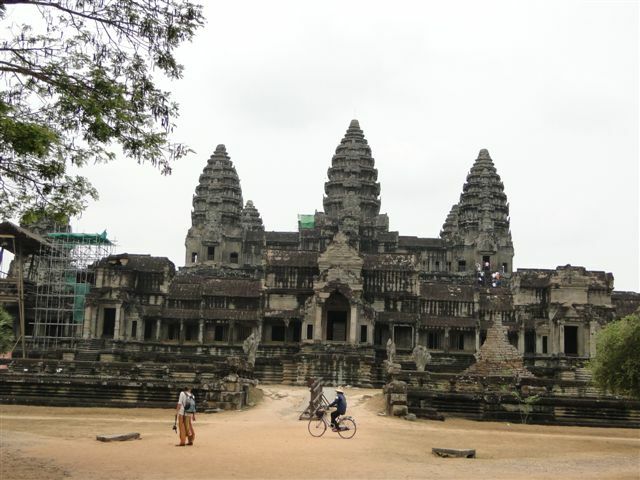 Khmers who interacted and traded freely with the Indian kingdoms (Cholas etc) and zealously went about constructing magnificent temples across their empire. 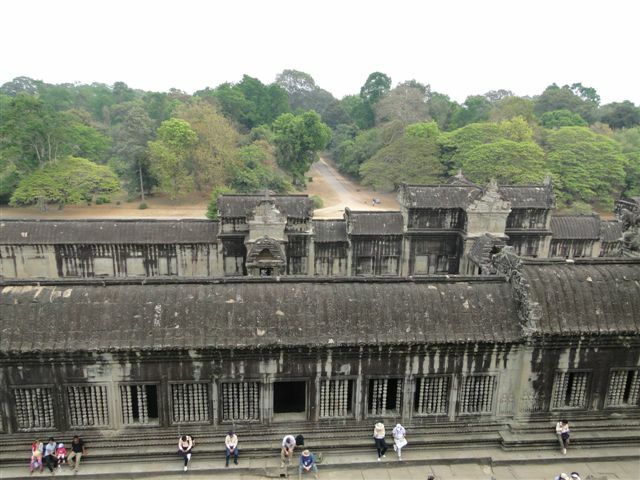 A large number of them are in the Angkor Vat region including the famous Angkor Vat temple. I had the opportunity to visit three of the temples on a trip to Cambodia last week. 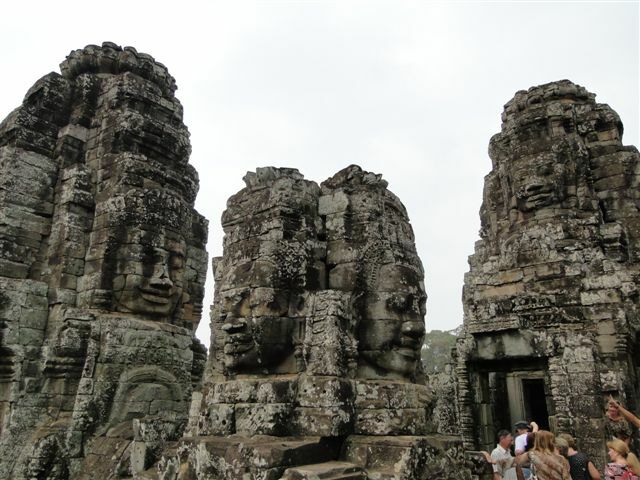 Bayon temple, made sometime in the 1200’s, is a cluster of towers each with Buddha’s face carved on the four sides, sometimes with only on one or two faces. The temple is made entirely of rocks (Lateritic rocks, I am told, from the neighbouring mountains.). Not carved into hilly slopes the way the Ajanta caves are, nor fashioned out of one single rock like the temple in Ellora. But huge rectangular chunks of these rocks stacked one atop the other without any binder like cement or mortar to hold two of these rock pieces together. I wonder how this structure could hold and then I am told by our guide that it is the weight of the rocks which ensures stability! Some engineering creativity here! The towers have this eerie, grey, weather-beaten look. It is something about the rocks I surmise. Let me describe a rock piece to you. Imagine a tower of polished black granite. Gleaming in the sun. And then a few years of acid-laced rains eats into the granite leaving blotches and pits all over the surface. Then someone with a giant sandpapering machine gets to work on this mottled surface making it even rougher. To complete the effect someone carries a large hose pipe and sprays tons of liters of a powerful bleach on these rocks. The temple complex is, well, complex, and feels like a maze inside. You climb up into a narrow aisle and you climb down into an even narrower one. Look around diligently and you find gems of such carvings. One should ideally devote at least 2-3 hours to take in all the details. Thirty minutes is all we could spare! It is the trees which give the defining look to this temple. 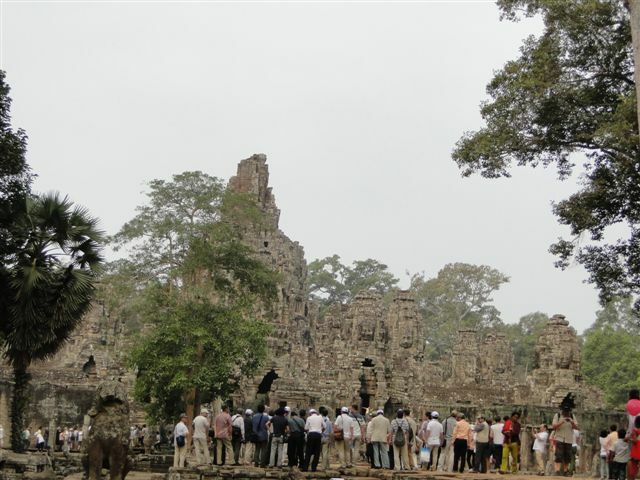 Apparently, the chaps who were responsible for discovering and then repairing the Angkor Vat ruins decided to leave one temple in the “original” state to tell the visitors- and the world- what the real state of a temple was when it was discovered. 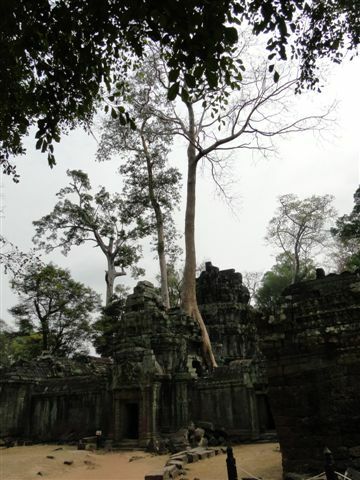 The last of the Ta Prohm tree pics! All this time, over the last hour, I have not seen a single Indian tourist, the tourists were nearly all Caucasians or from the Far East: Koreans, Japanese etc. Suddenly I notice a very Indian-looking gentleman walking very purposefully up and down a corridor. I sidle up to him and ask what was he doing here alone and where his family was. (Only an Indian can ask another Indian about the family, others discuss the weather or football!). I decided to move on from my excited- and silly- ASI chants. “My name is Ojha, Santosh Ojha, I am from Bangalore”, I offer him my business card. I inspect his card with due reverence. “T.K. 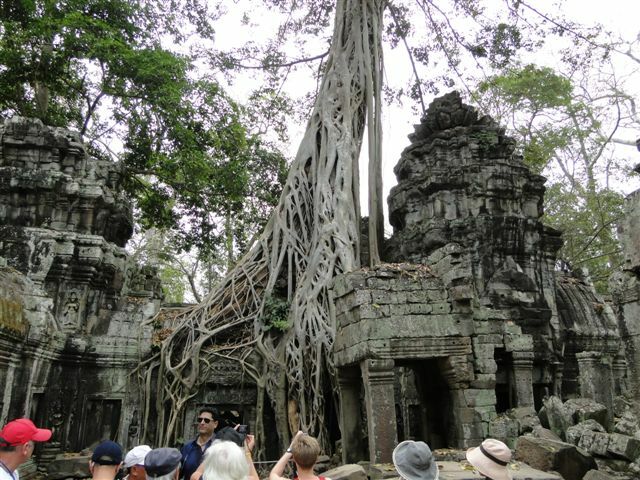 Ganjoo“, Senior Conservation Assistant, Project: Conservation and Restoration of Ta Prohm Temple. 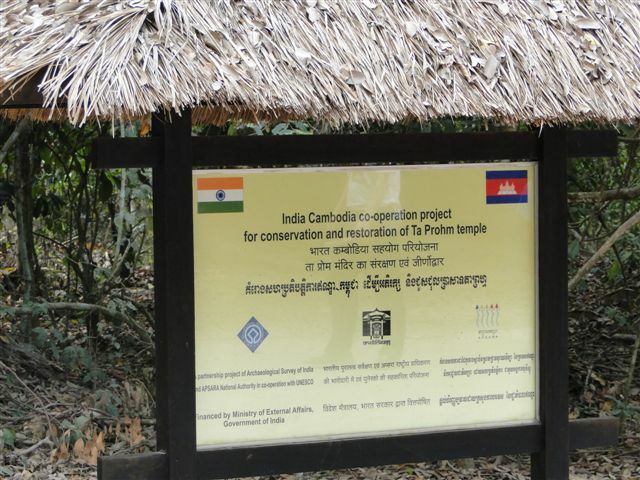 A partnership Project of ASI and SPSARA Authority Conservation D’Angkor Siem Reap Cambodia”. On the top right of the card is the legend Government of India (Ministry of Culture). And on the top left the ASI logo. “Kashmiri I am sure!” I showed off my knowledge about Indian names. “Great job you are doing!” I complement him. 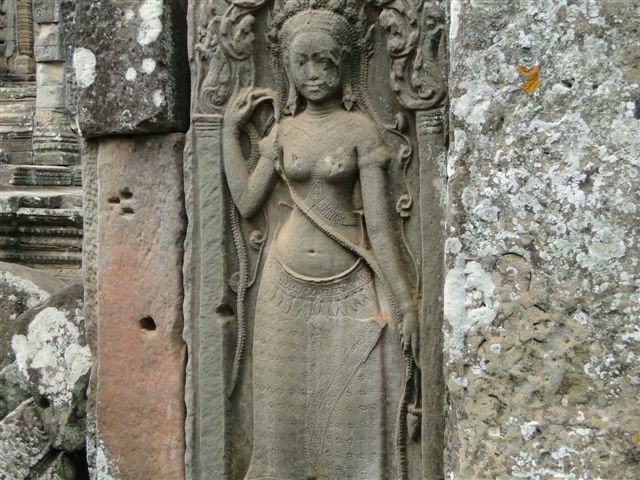 Of course, Ta Prohm is intended to be kept on an as-is, what-is basis! 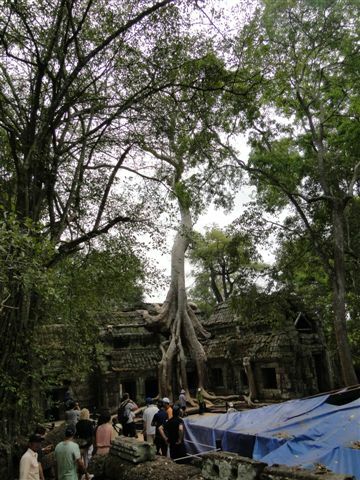 And a ten year project to maintain Ta Prohm in its pristine glory! Now you know the complexity of the job at hand at the Angkor Vat Complex! 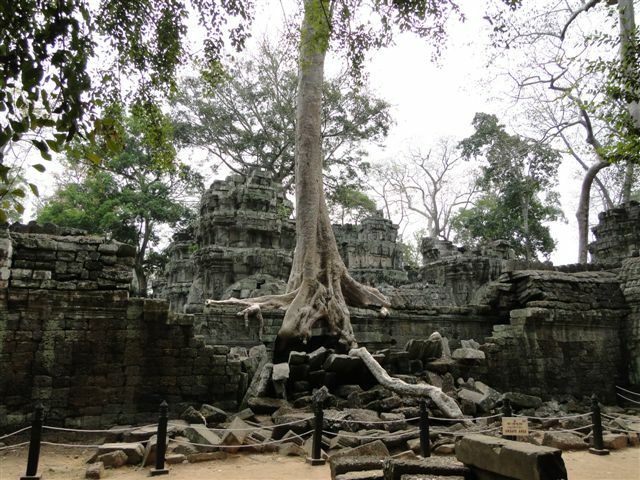 Unfortuantely, I never did get round to revisiting Ta Prohm temple again. 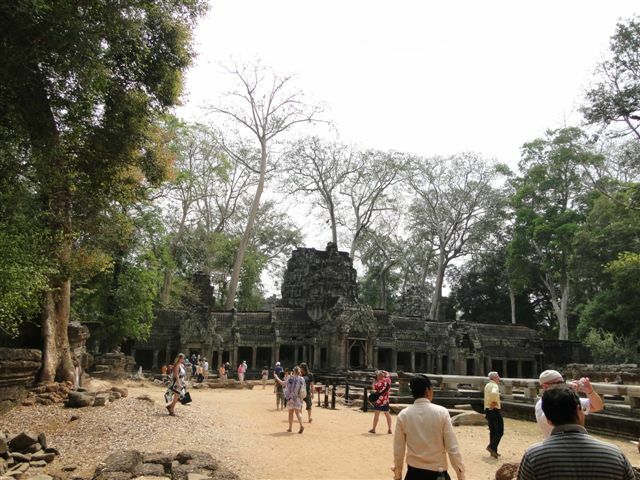 As I exit the Ta Prohm complex I cannot help but mention three things. The ensemble of musicians squatting on the floor at the exit playing some lovely music. And then I see the display board next to the music party, it comprised solely of men who were victims of land mines who lost their limbs in the civil war of the 70’s and 80’s. Cambodia has the highest per capita victims of land mines. As we emerge out of Ta Prohm complex, we are accosted by little girls, some as little as 4 or 5 years. 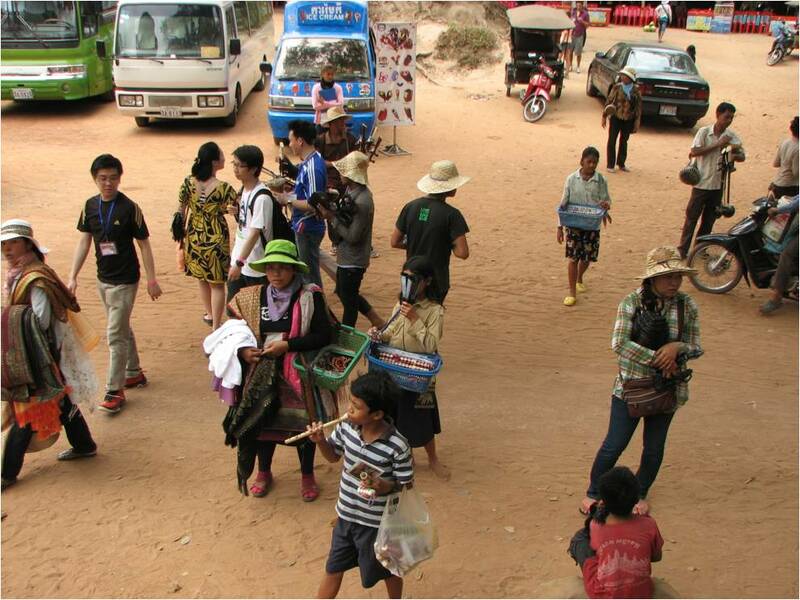 “One dollah, saah, one dollah, you mah friend.” One US dollar could fetch me one bottle of water, a pair of bracelets or even a folding fan to give me relief from the hot Cambodian weather! Angkor Vat is the largest Hindu temple I have ever seen. I thought Meenakshi temple at Madurai was huge, but you must see Angkor Vat to see what huge means. I read later that this temple has a total area of 200 hectares, a rectangle of 1.5km by 1.3 km. A temple to beat all temples and that too built some 800 years ago. The structure of the temple is supposed to represent Mount Meru, the center of the Universe for Hindus. Originally built to have nine towers, only five survive the ravages of time. The outer four having disappeared altogether though they have left their marks on the temple periphery. The outer eight towers representing the mountains surrounding Mount Meru, the home of Gods. 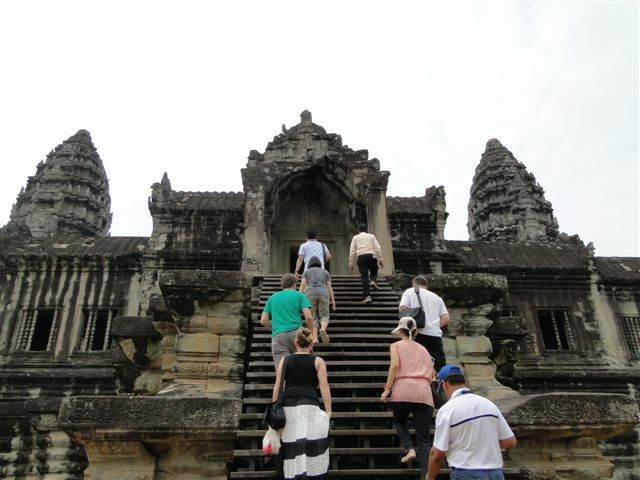 Those steep climbs at Angkor Vat! This is not a temple to be visited in an hour- the amount of time I could afford to spend there. You could go on for days and still not tire of it. And at the end of your visit you would have (re)visited the entire Hindu mythology. The battle of Kurukshetra, the Samudra Manthan, Hanuman identifying Himself to Sita at Ashok Vatika, Lanka Kand, Sita’s Agni Pariksha. Well, I could go on and on. Except that I did not have the time to see all this, what I mentioned above have been gleaned from reference books! The look and feel of this temple is similar to the previous two temples. Similarly hewn stones, erected in a similar manner; one rock slab stacked over the other. It is just the dimension of the temple complex overpowers you. As I walk through the galleries, I spy upon a row of Buddha statues which had one thing in common; they were all decapitated! Not the Taliban effect, but the work of local vandals who have looted artifacts over the centuries. And yes, Buddha was there all over the place even in this overtly Hindu temple! 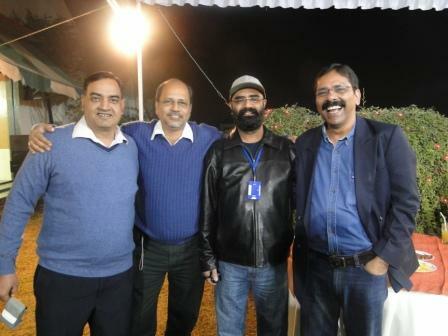 I was woken up by a call from Bipin Jha, an old friend and an ex roommate at 112, Limbdi. I now had some urgent matters to attend to. Bipin had a tummy upset and needed some medication. And I had a very old favour to return. As I told you, Bipin was my room mate in our first year. He, incidentally, is also from my school in Jamshedpur but I barely knew him then. He was the one who had nursed me into health when I was having a severe bout of blood dysentery. So much so that we had to seek specialist care at the University’s hospital, Sir Sundar Lal Hospital, commonly called SL by the campus denizens. But the problem with the hospital was that it was not limited to only the Univ. students. Patients came from far and wide, such was the reputation of the hospital those days. (It is another matter that the University residents got thrown far and wide as a consequence of events in the hospital, but more about that later.) And for anyone to get some time with the consultant on duty was a difficult proposition. And I, and for that matter, Bipin, were just a few weeks old in the campus. No hope for me. Till Netaji’s intervention. BHU in that era was a hotbed of student politics. Politicians of all hues, parties, ages and departments were active in the campus. The Netaji referred to above was none other than IT’s Manoj Sinha. He accompanied me to SL, both astride a cycle-rikshaw with Bipin pedaling behind on his cycle. Thanks to Netaji, I was given a priority appointment by the doctor and was out of the hospital quickly. I think I am digressing now, the student politics of BHU deserves a post (maybe posts) of its own. Back to the Reunion meet. We reached the campus only at lunch time, the morning’s interaction was missed. We gathered that many in the IT café had missed the morning’s session as they were busy sight-seeing. But all made it a point to come for the lunch. Rantim (V Mech) and wife came from Sarnath, “No way we could miss out on the reunion meals”, they said! I shall not delve into the details of the spread, suffice it to say that it had a distinctive Rajasthani flavor. And a little Bhojpuri too. There was litti-and-chokha, amazingly well made. I was busy canvassing for this and I remember persuading many of my friends to have it. In case you are not familiar with this sinfully delicious stuff, here is a definitive guide to it! A most satisfactory lunch, I can tell you! 112, Limbdi. Do not miss the current occupant! Oh those hanging towels and undies! The scene outside the room was familiar, the famous towels and undies drying in the sun in the “lobby”. 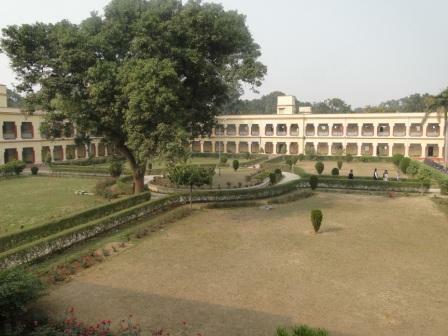 So reassuring, I thought to myself, there is a bit of the old BHU alive even now! A march to the “mess” after that. A current student was showing off the mess to his grand parents. We peered into the cavernous corridor of the mess from behind the closed doors but could not figure out any of the royalty; no maharajs around! 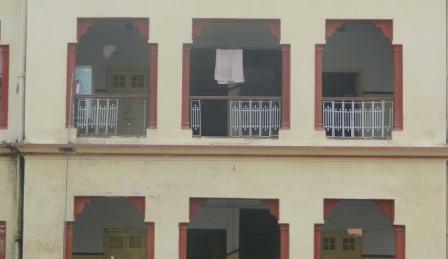 Even the “canteen” where Sri Hasanand Punjani, the canteen contractor ruled had been converted into multiple messes. After Limbdi we proceeded to the DG crossing, the setting for many an exciting debate during those five years. I have written about this in an earlier post of mine. The next stop was the Arts Faculty Auditorium. I was involved with dramatics in the campus; some plays I had directed while in the others I played various roles. A lightman, the backstage incharge, a prompter etc. 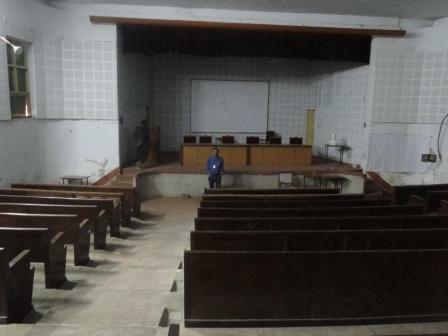 The auditorium was locked and some helpful persons guided me to the chowkidar of the Arts Faculty, I think Lachhoo was his name, who cheerfully opened the audi and let us in. Felt a bit weird to have it only for ourselves, no audience milling around! My kids were excited to see the stage where a “debacle” of sorts had happened during one of my plays, “Kamala”. Time to leave the campus, but a stop en route at pahalwan’s to partake of the delightful lassi! Unfortunately, there are three Pahalwan outlets at the same location (the family has split since we left the campus), none sells lawanglata anymore. The dinner was at the same venue as the previous night’s. And as expected, another grand affair! It was the Christmas day, and to add to the X’Mas cheers, the hall was done up with white and red balloons. The waiters wore the Santa Claus’ red peaked caps. I would not have been surprised if the caterer, who paid so much attention to details, brought in a pair of reindeers into the hall! And Santa Claus himself with his bag of goodies for us. Well, the caterer had the dimensions of Santa Claus and he was indeed carrying his bag of goodies. All spread on the tables for us to savor. Yet another fabulous meal. 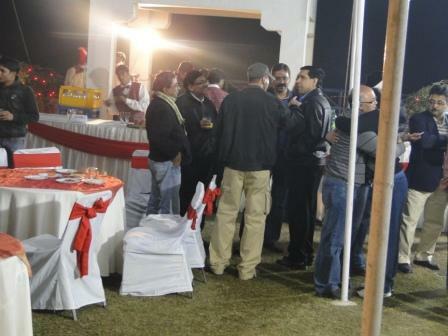 Thank you very much Milan Caterers, your fare made the reunion that much more memorable. Don't miss the peaked caps! The evening entertainment was provided by a one man band- Rolando orchestra. Rolando from equipment the “one-man” was playing on. I love music, but the action on the lawns outside was a lot more exciting. Just a few hours to go before this fairy tale of a reunion came to an end. Big time (re)-bonding was happening outside. 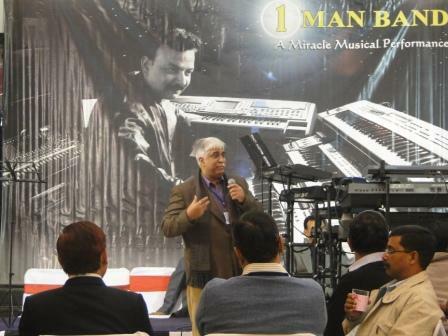 Anshu: the one man army! Sandy scurrying about with his massive photography equipment. Chellam urging all to fill in their demographics in a book he was carrying. Salil, the methodical organizer as ever, persuading the laggards to pay up the contribution for the reunion (I was one of the laggards). 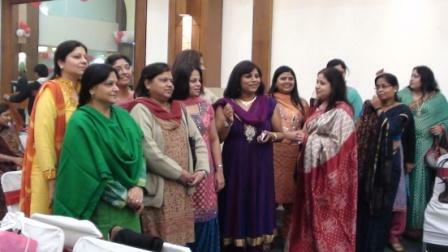 Anshu flitting from inside the hall to the lawns ensuring all were happy and occupied. Kaustabh making sure that his corner of imbibers were kept well provided for. Balaji doing what he does only can do best; regaling us with his one-liners delivered in his chaste Tamil-Mumbai Hindi. The sagely Chalis (beard-and-all) spreading peace all around. A shawl-clad Anant Arun guffawing as only he can. An impossibly black-bearded Panesar (which hair dye do you use? I need to try it out myself) narrating tales of Canada where he lives now. 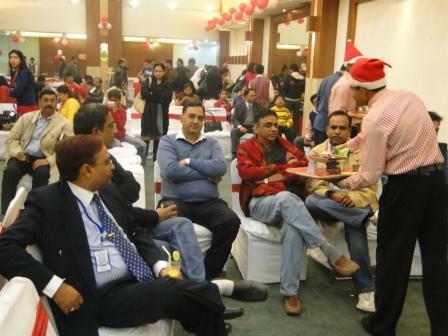 Bipin Jha, a little weakened after a night’s illness still managing to join in the revelry, that too minus a drink! Ojha is flitting between the lawn and the indoor hall. In the hall nibbling into a kabab, patting a friend’s son on his back, keeping an eye on his sons who were lost among their new-found friends, getting introduced to a friend’s wife. As his wife, who had kind-of forced her way into the reunion, bonds with the ladies in the group. Ojha returns to the lawns to discover the “smokers’ corner” even more active. He even gets invited to inaugurate a new smoke round. And clink glasses with yet another group. I get back to the lawns, the more happening place. 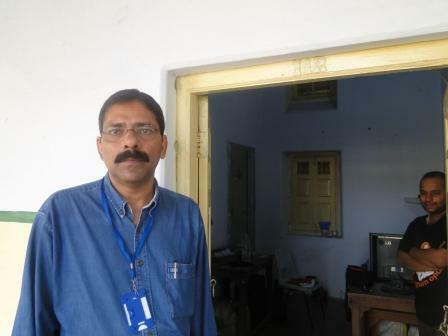 Manoj Prasad is intrigued I want to see a mine: Open cast he says, will you be interested? Of course I am, Manoj! I am now suddenly missing those who are not present there. Randomly. Ramki (one of the andhas in my play “Andho ka Haathi”). Partha Dey (the guitarist). Subhash Shanbhagh (Shambhu we called him). Rajesh Tiwari (Tavare, named after the Brit cricketer of those days, Chris Tavare). Biju John from Thiruvalla. Sunita Singh, the lone female protagonist I have had in my plays. Bhandarkar, for no reason at all. And then, I catch myself weeping, tears flowing down my cheeks.